DES MOINES, Iowa-The Republican Party of Iowa hosted a final farewell reception for the longest-serving Governor in United States History, Governor Terry Branstad, on Tuesday at the Airport Holiday Inn in Des Moines. Previous receptions were held in both Davenport and Sioux City in March. Republican Party of Iowa Chair Jeff Kaufmann welcomed an audience of over 400 and served as the emcee as he interviewed the Governor about growing up on a farm in northern in Iowa, his time in office, and looking forward to his role as ambassador to China. Lieutenant Governor Kim Reynolds expressed her gratitude to Governor Branstad for his leadership and mentorship. “I have had the honor of being mentored by one of the best Governors in the nation,” said Reynolds. During the program, Kaufmann asked the Governor what inspired him to run for office. “I was motivated by a couple of 8th grade teachers. They taught me about the Bill of Rights, and the importance of respecting others’ rights, being honest, working hard, and giving back to the community,” said Branstad. When asked why he decided to run again after his absence, Governor Branstad said, “I had a good job at Des Moines University. But I saw the mess the state was in after the Culver administration. We were accumulating a massive debt. My former chief of staff and Bruce Rastetter started a draft effort for me to run again”. Jeff Kaufmann said that regardless of party, there are two things that all Iowans can agree on:Governor Branstad is a man of honesty and integrity, and that he dearly loves the state of Iowa. 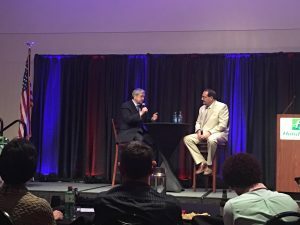 When he asked Branstad why he loves Iowa so deeply, the Governor cited the state’s quality education system, the people who live here, and said that “After two years of being away in the Army, I gained a greater appreciation for Iowa”. Kaufmann asked the Governor about some of the difficult decisions that he has faced while in office. Branstad mentioned the Farm Crisis of the 1980’s and said that he helped to lead the recovery effort by “diversifying the agricultural economy with biodiesel and wind energy and by going to bat for Iowa at the federal level”. When questioned about how prepared Reynolds is to take the reins after Branstad leaves for China “on a scale of 1-10”, the Governor responded with an enthusiastic “11!” He went on to say that he was impressed by her not only as his Lieutenant Governor, but by her performance as the Clarke County Treasurer and when she suggested that current Senator Joni Ernst replace her in the Iowa Senate when she vacated the seat to run as Lieutenant Governor. “She knows much more about the state budget than former Governor Chet Culver,” said Branstad. The final question that Jeff Kaufmann asked Governor Branstad was what advice he would give to young Iowans. In closing, the Governor reflected on the sweeping victory that the Republican Party had in Iowa in 2016.